Intermediate/Advanced. A sweater that has evolved from the poncho, Wisteria is a trapeze raglan turtleneck pullover. Beginner/Intermediate. 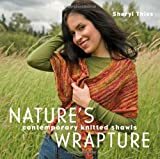 For cool days or to keep you warm when the thermostat is turned down low, knit this stylish poncho. Intermediate. This classically designed cape looks just as fashionable today as when it was first published in 1972. Gauge: 12.0 stitches per inch or 48.0 stitches per 4 inches. Gauge: 16.0 stitches per inch or 64.0 stitches per 4 inches. Intermediate. A "knit in the round" wrap with drop-stitch and eyelet detail. Beginner/Intermediate. Knits up in a flash on oversized needles. Gauge: 2.25 stitches per inch or 9.0 stitches per 4 inches. Beginner. This is simply a large rectangle, folded in half and seamed up one side leaving a neck hole. Intermediate. Beautiful cabled poncho, using bulky yarn for fast knitting. I've seen it made without fringe as well. Gorgeous!